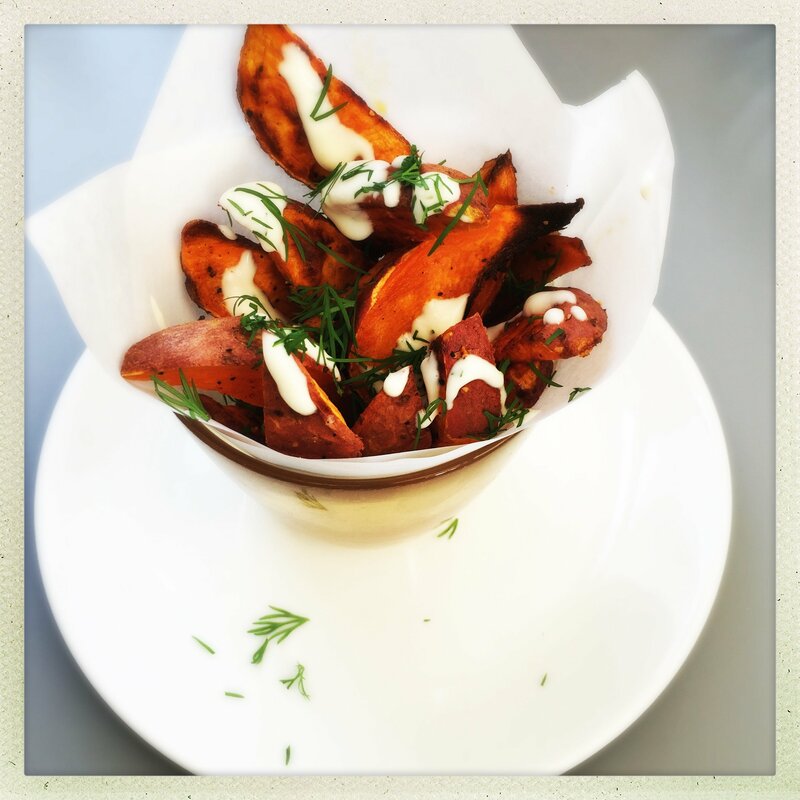 These sweet potato wedges are one of my favourite things to cook at the moment. They always taste good and well, that lemon and dill mayonnaise drizzled over them… just makes them even better! 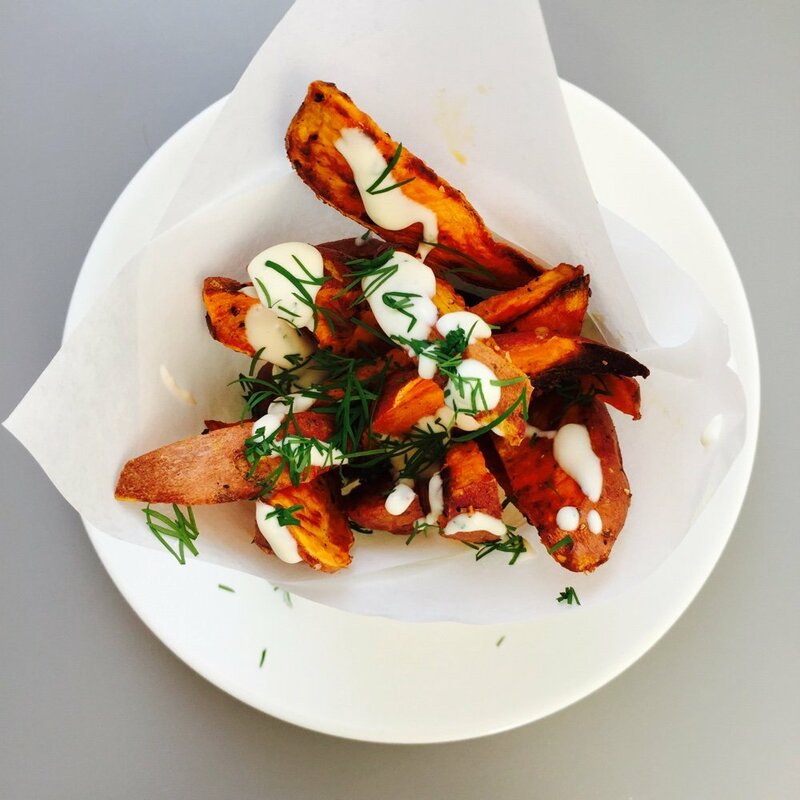 Sweet potato wedges take less time to make than ordinary white potatoes and contain less carbs so they really are a win-win. To make a batch of these delicious, crisp, sweet potato wedges, just scrub the sweet potatoes, slice into wedges and toss in a tablespoon of olive oil, bake for 20 minutes. Job done. The nicest sweet potato wedges. Ever. small handful of dill, finely snipped. Scrub the sweet potatoes to remove all dirt. Slice them in halves and then each half into wedges. Put them in a mixing bowl, pour over the oil, season with salt and black pepper, then toss together using your hands to coat everything evenly. Tip the wedges into a non-stick roasting tin and cook in the oven for around 20 minutes. Whilst they cook make the flavoured mayonnaise. Add the mayonnaise to a small bowl, pour in the lemon juice and stir through the snipped up dill. Once the wedges are cooked serve them with a little drizzle of the tangy mayonnaise. Spice the wedges up with a sprinkling of cayenne pepper or pinch of chilli flakes. Flavour your mayonnaise with garlic or lime and coriander. Delicious straight out of the oven drizzled with lemon and dill mayo, great alongside a big juicy burger. These wedges taste delicious cold, dipped in hummus – you might like to try our vibrant and earthy beetroot hummus.